Cornwall has some of the best beaches in the UK and due to being exposed to the Atlantic it picks up some great surf on both the North and South coasts. Many of the UK’s surfers head West to make the most of a variety of breaks in a stunning part of the country which is renowned for the Cornish pasty, clotted cream and holidays. Not a break for the faint hearted, this famed reef break on the South Coast of Cornwall breaks from 2ft upwards and can hold big swells. A little beyond the working fishing harbour, the reef break can be accessed over rocks, choose your time to make the paddle to avoid being caught out by a sweeping set. Known for being a hollow right (the left is a bit tricky), this spot is the favourite of many surfers in Cornwall when the North Coast is onshore. Busy when on, so be polite and respect the locals and don’t expect to take the set waves. If you luck into the right wave it will probably be one to remember! 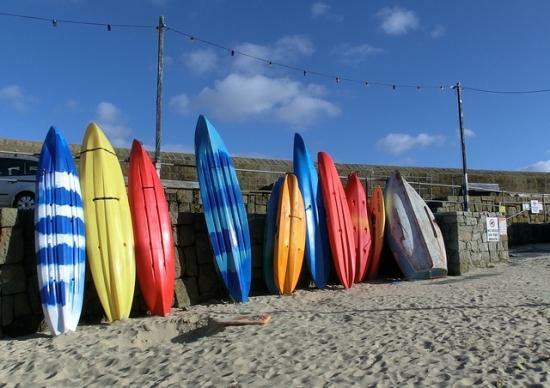 Located in the heart of St Ives with the Tate Gallery overlooking the beach, it’s a great setting and offers hollow powerful waves in big Westerly swells at the right tides. In the summer it’s a great beach for learning, but it is in the winter when it really lights up as it offers some protection from the prevailing South Westerly winds. Not unknown to break boards, especially low tide at Boilers (the East end of the beach), get the right bank and some barrels can certainly be had. It can get busy and is really popular with local surfers, but a friendly atmosphere helps keep the water relaxed. The standard of surfing is excellent so once again keep the peace by being polite and knowing the rules. My personal favourite, this stretch of sand has many different banks at different tides producing hollow long lefts and rights at low and wedgy waves at high. Its more exposed than some other West facing beaches so hoovers up any swell going. To the West is Lushington’s, generally accessible at low tide, and to the East Flat Rock and Chapel Porth in the distance. Being near to Falmouth, Camborne and Redruth and with high quality waves crowds are inevitable, help matters by using the pay and display car park rather than the road or waterworks and be extra polite and you will have a good time. It is on the edge of the renowned “Badlands” of surfing, so the standard of surfing is very high. Not a break for beginners as rip currents can be fierce, waves heavy and water busy. Apres surf pint at Blue Bar is essential! On the tip of West Cornwall the closest beach to Lands End is often a good option for a surf, and often quieter than the other main breaks. At low tide Sennen and Gwenver are connected, at high North Rocks separates them. Gwenver the smaller beach to the North is a swell magnet and can be great when other places are too small. As the swell grows so do the rips and it can get unwieldy quite quickly in larger swells. The walk back to the car is always tough after a long surf, but worth it every time. Sennen is the place to go for less experienced surfers and on the larger days. Its very bank dependent but the long stretch of sand often has good waves around mid tide. A getaway from the crowds in bigger swells this spot rarely has anyone in the water, I’m never too sure why as it’s a great place, maybe it’s the 20-30 minute walk just to check it! Mostly a reef break it throws up a handsome A frame surrounded by tall cliffs. Getting to the water can be a challenge, slippery paths, rocks and gorse help make the challenge harder, once in, the clear waters match a tropical country on a sunny day. We can’t tell you where or when it will work, but it is out there and maybe one day you’ll stumble across it. Sam the author of the top 5 surf breaks in Cornwall works for The Sail Lofts, St Ives who offer boutique self catering accommodation in St Ives. He is an avid surfer getting into the water most days and spends a lot of time exploring the local coastline for the best waves on the day.